Obituary – Moore, Jack Chester « Perry High School Alumni Association, Inc.
Former Perryan Jack C. Moore, 67, Midwest City, died March 10, 1997, following surgery at Midwest City hospital. Funeral will be at 11 a.m., Thursday, in the Bill Eisenhour Funeral Homes, Inc., northeast chapel. Burial will be at 2 p.m., Thursday, at St. Rose of Lima Catholic cemetery at Perry. Moore was born in Perry on Sept. 22, 1929, the son of Chester and Velma (Evans) Moore. 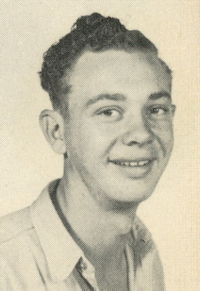 He was a graduate of Perry high school and had worked for the city of Perry and Cockrum’s service station. He operated the Phillips 66 service station at Sixth and Grove streets in Per­ry before moving to Midwest City, where he worked as an appliance re­pairman. Moore had lived in Midwest City since 1962. Among survivors are three daughters and two sons-in-law, Debbie and Michael Castro and Mary and Wade Taylor, all of Norman, and Patty Wolfe, Midwest City; his mother, Velma Moore, Perry; one brother, Tom Moore, Perry; two sisters, Betty Watson, Arlington, TX, and Deanna Oge, Ard­more; five grandchildren; several nieces and nephews and a special friend, Edna Hungerford, Midwest City. Moore was preceded in death by his father and his wife, Margaret Fern Moore.